In outline, the process to incorporate an existing business (i.e. turn it from a partnership or sole trader's business into a company) is for a new company to be registered and then, on an appropriate date, for the business to be sold to the company at an appropriate value, the consideration for which is shares in the company. There are many legal, taxation and practical considerations to take into account when undertaking this process and the advice of experienced practitioners should be sought. A typical process would be the following. 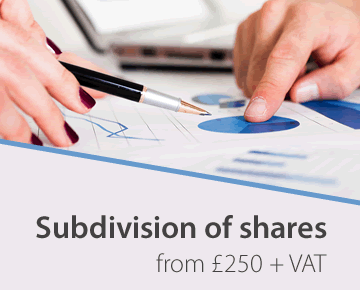 An existing sole trader's or partnership business worth, say, £100,000 is to be incorporated. A new company is registered and a date chosen for the new company to take over the business. The assets are listed and valued. A short form of contract is drawn up between the sole trader or partners (as vendors) and the company (as purchaser), under which the partners are to sell the business assets to the company for £100,000, to be met by the issue to the sole trader or partners of 100,000 £1 ordinary shares in the company, to be allotted to the partners in proportion to their ownership of the business. The company law procedures will then be those for an allotment of shares for non-cash assets. Care must be taken to ensure that all the procedures relating to an allotment of shares are complied with (sufficient authorised capital, directors' authority to allot, pre-emptive rights, etc.) and, assuming that the partners are the directors of the new company, it must be noted that this will be a transaction in which they are interested. In nearly all circumstances, it will be a substantial property transaction within CA 1985, sec320 and so will have to be approved by a resolution of the members. The cessation of business by the sole trader or partners and the transfer of the assets of the business to the company will have income tax and (potentially) capital gains tax implications. The taxation of the profits of the business in the future will be subject to a different tax regime from the income tax previously paid. There may also be stamp duty implications on the transfer. These matters are presently beyond the scope of this database, and appropriate professional advice should be sought on these tax matters. Company Law Solutions provides an expert service for the incorporation of an existing business, whether it is a sole trader's or a partnership business.